Taking its name from the Dutch east India Company, these gardens were developed in 1652 and are a great place to hang out in Cape Town. Ideal for picnics and day outs, these gardens have number of activities for recreation and entertainment. The special feature of the garden includes the pear tree which is standing since 1652. Historic statues, memorial slave bell and other historic objects dating back to the company’s regime. Brochures for self-guided tours are available. How popular is Company's Gardens? People normally club together Table Mountain and Rhodes Memorial while planning their visit to Company's Gardens. Company Garden & Government Avenue. Company Garden is located on Government Avenue. This review includes both, the Company Garden as well as Government Avenue. We left Hotel around 0900 AM. After a drive of around an hour we were dropped at the junction of beginning of Adderley Street and Government Avenue. During the drive passed thorough some well maintained roads and interesting sights and statues. The Avenue bisects Central Garden. Many historically buildings are seen along and around the Government Avenue. It is a walking street. we did not walk the full length of Government Avenue but left it after Company Garden to rendezvous with our coach. The street was made in 1679 or so. Planted on both sides by Oak Tree. Over a period of time original oak trees have been replaced by different varieties of oak trees. 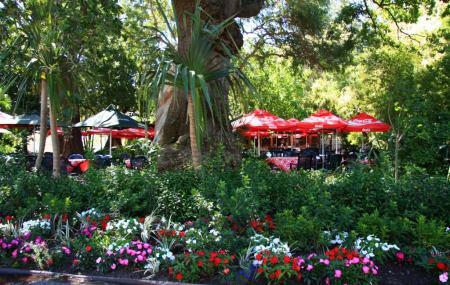 It is a very pleasant walk and today forms one of the tourist attractions of Cape Town. Important buildings and monuments along the street were well maintained and preserved. Made for good photo shoot. Wiki help for some data. Squirrels and wild geese very friendly and love the peanuts. Love the interaction between humans and animal. Gardens are still green. Child friendly, although there is a lot of homeless people sleeping on the grounds, steps and on the chairs. Near the museum and busy city.